MVT Forum: Have you had issues / Resolution? This article on Zerogov was brought to my attention on the MVT Forum, because it mentions Max Velocity Tactical and TacGun. John has written a lot of sense in posts on Zerogov, and he makes a lot of sense here also. The most relevant part of the article is copied below, but I intend to comment , and extrapolate from, a number of things that John has said. Since this article is directed at the survival type audience, I want to point this out. Different groups in the tactical/preparedness/Threeper milieu view Max Velocity Tactical in different ways. Some love, some hate. I could care less about drama but I like what MVT is doing. He is undoubtedly onto something with his TacGun concept. It seeks to separate things such as Small Unit Tactics (SUT) training from the Derp infested militia and preparedness scenes. It incorporates worthwhile aspects of many cross sections of both tactical and competition oriented firearms training. Physical fitness is a key element. There may be a 2-gun match day or a Force on Force day. I dig what Max is putting down. In essence he wants it all, and so do I, and working to remove the stigma of the overweight Militia “Colonel” in full camo from legitimate training is a very commendable effort. I have a number of things to say both about the quoted part above, and also the general sense of John’s article. In it he talks about the divide between ‘tactical timmy’s’ and ‘gamers.’ This appears to very much be a thing – there is a divide between the flat range ‘gamers’ and the camo-clad tactical types. Both of them are wrong. I will explain. I am continually baffled when I read that “Different groups in the tactical/preparedness/Threeper milieu view Max Velocity Tactical in different ways. Some love, some hate.” Why is that? What is there to hate? Max Velocity Tactical is a unique organization that offers truly professional tactical training across the spectrum. If you don’t like that, then there is an issue. But some of the answers are in the article that John wrote. I explain in the linked post that MVT definitely came up through the prepper scene, rather than as a mainstream tactical school; however, what we offer is something that spans the spectrum of the tactical training world. Some, who thought MVT was there to fulfill their tactical prepper fantasy camp requirement, have become disappointed. We run flat range training of the highest order. We now have fitness requirements. For many a ‘tactical timmy’ it is too much, and it is a threat to their own lunchtime legend, hence much of the hate. On the flip side, as I have described, many of the gamer types are totally put off by mention of ‘prepper’ and any association with ‘militia.’ Hence the TacGun concept that John refers to. There is an inherent unfairness in what John writes (aimed at the ‘tactical-timmy’ and his camo), but I understand why he writes it. The MVT experience is that since we began to run civilian training over four years ago, we have been to expanding ‘backwards” into weapon manipulation and flat range training. We overestimated the skill with their weapons that students from the prepper milieu would bring to the game. To be totally frank, they mostly have no skill at all, and are a liability to themselves; certainly not skill under pressure in a simulated combat environment where it counts. Tie that in with a refusal to do any meaningful, PT, and you have a recipe for disaster. People are kidding themselves. Now, we have 4 day HEAT 1 classes, including 2 days on the flat range, and we have fitness requirements for any class that ventures beyond the flat range. On the other side, is the ‘gamer’ who never leaves the flat range. He may put out some barrels, barricades, and cars and think he is doing tactical training, but he is kidding himself. This is the secret. Tactical training is a progression. That is what we do at MVT and why we are a unique organization in the depth to which we take this. People who never leave the flat range can get very good at weapon manipulation, and into the rabbit hole of the minutiae and current trends, but they mostly lack tactical context. You only have to sit in an MVT post-class AAR, or ask an alumni of an MVT tactical class, and they will explain to you how half the secret is in the awareness they have gained, the ability to scan, to really scan. The ability to open up the tunnel vision and be aware of what is going on around them, to communicate. All this in an environment that is designed to be constructively stress-inducing, and where you do not necessarily know where the next Ivan will pop-up from. You cannot get this on the flat range, however fast you get. MVT knows the secret, and we are running with it. If you stuck in one training camp or the other, you are fooling yourself. It is a progression loop: the weapon manipulation and flat range drills support performance on the tactical ranges, which also includes conducting manipulation, and then that loops back as you continue to train, and what you learn on the tactical ranges improves your performance on the flat range. Progression loop, always looping back and improving. Flat range progresses to live tactical ranges, which progress to patrol classes where more complex operations are conducted. Force on Force is an option which brings in a whole new level of awareness, communication, leadership and teamwork. That all loops back to your defensive concealed handgun, and your general awareness and readiness day to day. TacGun is an attempt to unite the two camps. Competition has a lot of value, and it also has dangers, but if you have followed the progression and have tactical context, then it will not be an issue for you. We don’t use shot-timers at MVT classes, because it is not a useful part of the POI. 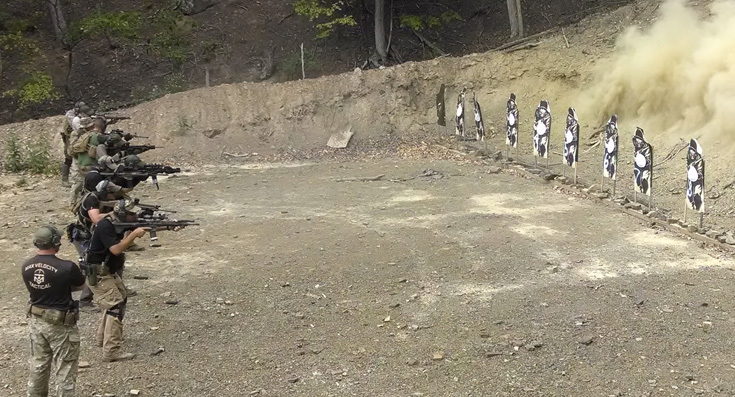 But I found myself shooting on a fun end-of-class range day with one of the recent SOF teams that have come through the VTC, and we were doing versions of the 1-5 drill with shot timers. For fun and variety – but I can assure you, we all know the context of it. Mostly on MVT flat range classes, we are actually encouraging people to slow themselves down and the think through the drill, in order to embed it correctly, hence self-pressure is often too much in itself, and shot-timers would not be appropriate. This is actually where, as an anecdote, I can explain that although “slow is smooth and smooth is fast” has become over-used and misunderstood, and John derides it, I understand the original intent. It is about ‘muscle memory’ and embedding the drill at a controlled pace. That slow attention to the drill will make it smooth and through that smoothness will develop drills done faster, but correctly. It is not really that complicated, or a necessary reason for derision. Just old school basics. One thing that really has to be understood, is that it is not really about the shooting. We can easily teach you to shoot well enough under pressure to hit ‘minute of man’ and have a good chance of surviving an engagement. But ask any MVT student – the hard part is the ‘move and communicate’ part of the ‘shoot, move and communicate’ triad. The scanning (real scanning) and the awareness. It is not hard to read on the internet, or here, or in the Ranger Handbook. Anyone can do that, right? This is the disservice that many ‘gamers’ and the instructors that cater to them, do. They do not have a correct training progression, and thus the training is stunted, it cannot really ever go anywhere meaningful. This is the ‘minutiae’ of weapons manipulation that we refer to, gaming the flat range. Weapons manipulation itself is vital, and we focus heavily on it, but mainly as a means to allow focus to be on the environment, threat, and team actions, so you are not consumed by how to get your weapon back in the fight. In summary, if you focus only on one camp, you are doing yourself a disservice. It is wrong to deride ‘tactical timmy’ for wanting to study team tactics, but it is right to explain to him that he needs to be better at the basics in order to progress correctly. He needs to have sufficient PT levels. The flat range aficionado considers himself to definitely not a be a ‘prepper nutjob’ but he is not half as enlightened as the thinks he is, and he really needs to get some professional tactical training to round himself out. None of this is rocket science; You may see yourself as a prepper or survivalist, but at the end of the day you are leveraging light infantry training and skills in order to become tactically prepared, whether or not you are willing to accept that. Progression is what we used to do in the military and it certainly never stopped on the flat range. Proper field training, live fire and force on force, is essential, on top of those good basics. One thing that John has not done, is come training at MVT. I believe he needs to rectify that. Then he can write all about MVT.